Jurassic World directed by Colin Trevorrow and starring Chris Pratt and Bryce Dallas Howard is the Blockbuster hit of summer 2015! The action adventure Sci-Fi thriller takes place twenty-two years after things went awry at the island of Isla Nublar. Now it is not just a park, but a full functioning adventure theme park like Disney World, which is reflective of John Hammond’s original vision from the 90’s. This island has a long list of dinosaurs and would not be complete without the genetically modified mutant dinosaur. Yes I said mutant because a lot of them are not purebred, but completely engineered with the DNA of other dinosaurs and animals like frogs and fish. Claire a strong career driven woman played by Howard runs the massive island with an iron fist. She is soon forced to take on the role of responsible caregiver, when her sister sends her two boys on a vacation to the theme park for some much needed family time. Gray and Zach—Claire’s nephews arrive to find out that their family vacation with their aunt is now just a play-date for two. Claire continues to run things and trusts her assistant with the care of her nephews. The two quickly ditch their chaperone and start to tour the island by themselves. Meanwhile Owen played by Pratt—an ex-military man and animal specialist works at the park training Raptors. He demonstrates his progress to some of the leading experts on the island and Claire requests his assistance before she opens a new exhibit at the park. She shows him the place where a new dinosaur will be revealed. Owen expresses his initial concerns when he finds some potential weak spots in the habitat containment unit. A small incident occurs when some of the dinosaurs escape their habitat. Claire believes that she has everything under control, but it is just the beginning of a chain of events that eventually leads to the escape of one of the most dangerous creatures that man has ever encountered. The playdate for two quickly transitions into a journey of survival as they along with Claire and Owen fight to survive the earthly beasts that the island has to offer. What can I say? This movie was just great. I’m still thinking about it and I saw it Saturday night. Everything about this movie was awesome. The storyline, character portrayal and development, score and sound, and the special effects were amazing. 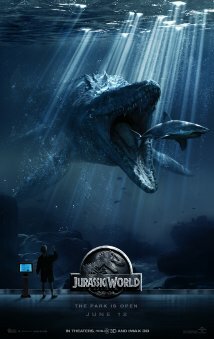 I’ve been looking forward to seeing this movie ever since I found out that they were doing a Jurassic World. I saw it in 3D which enhanced the movie experience for me. Chris Pratt did a wonderful job with his character and he made me feel that old school excitement for cinema that only classic Harrison Ford can channel. The director Colin Trevorrow’s vison moved me as he showcased his own unique abilities while conjuring some of Spielberg’s inspiration. This movie is worth seeing a second time. Just thinking about it makes me smile which you will too, once you’re in your seat. I gave this movie 5 stars. If I could give more I would.